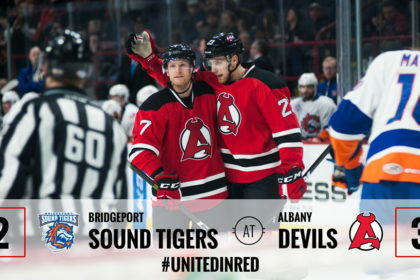 ALBANY, NY — The Albany Devils opened 2017 and concluded their 3-in-3 weekend with a win on home ice Sunday, defeating the Bridgeport Sound Tigers, 3-2, while securing six out of six points. Goals from Ben Sexton, Vojtech Mozik, and Blake Coleman gave the Devils their third straight win as they improve to 19-13-0-1. Mozik added two assists to his tally for his first multi-point effort of the season. Sexton opened the scoring early by putting one past Bridgeport goaltender Eamon McAdam at 1:32 of the first period for his third goal in three games. John Quenneville provided the assist for his fifth point in five games, and Mozik registered the secondary helper. 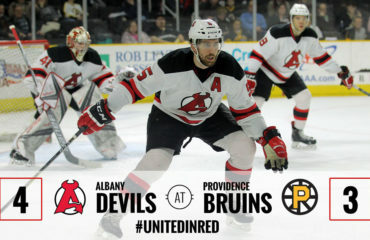 Mozik then followed with a power-play goal at 10:32 to give the Devils a 2-0 advantage at the end of the first period. 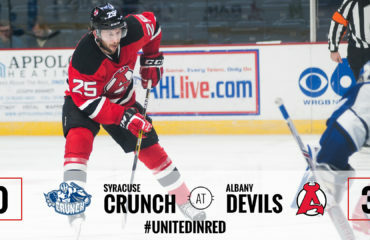 Coleman picked up Albany’s second power-play goal of the game at 7:59 of the second period when he deflected a Mozik shot that came from just inside the blue line. The tally was his tenth of the season. Mackenzie Blackwood lost his shutout bid with under five minutes remaining in the third period, but was strong in net stopping 30 of 32 shots. Karl Stollery picked up two assists and Blake Pietila was credited with one as well to run his point streak to three games. 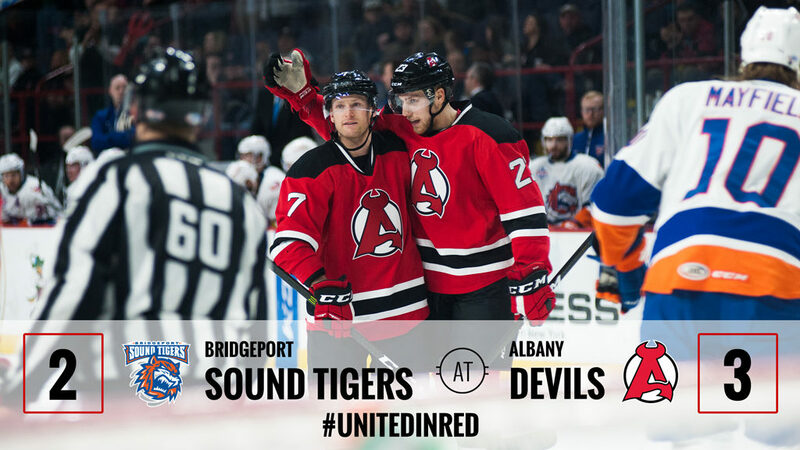 Steve Bernier and Andrew Rowe scored for the Sound Tigers at 15:55 and 18:16, respectively, of the third period to cut the Devils’ lead down to 3-2. McAdam gave up two goals on four shots before being pulled for Stephon Williams, who made 14 saves on 15 shots between the pipes for Bridgeport. The Sound Tigers record moves to 17-14-0-0. 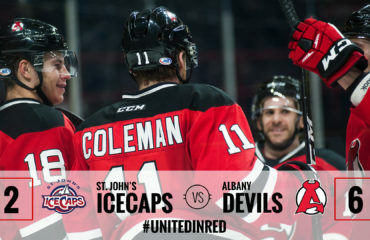 The Devils host the St. John’s IceCaps Wednesday at Times Union Center for a 7 pm puck drop.